A loonie can now buy you a can of beer in Ontario — that is, if you can find some. Just three brewers have signed up for Premier Doug Ford's buck-a-beer challenge ahead of the Labour Day weekend, and a limited number of LCBO and Beer Store locations are stocking the product. The Ontario government has officially dropped the minimum price of a bottle or can of beer to $1 from $1.25, allowing for cheaper suds to reach the shelves. However, brewers are not required to charge less and the lower minimum price does not apply to draft beer, nor does it include the bottle deposit. 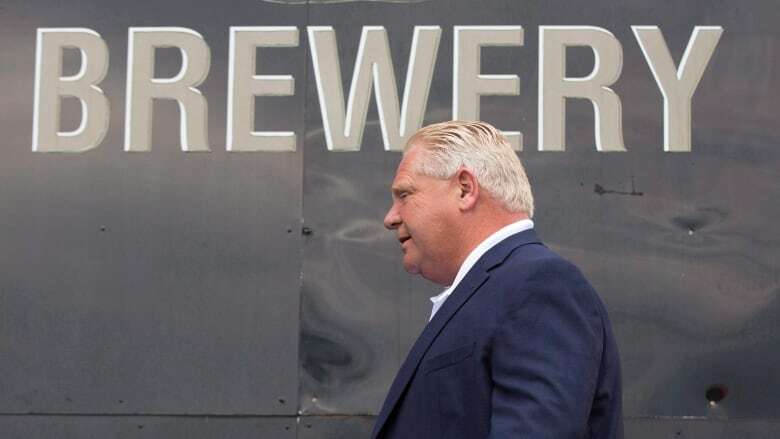 The biggest names in brewing and hundreds of Ontario's craft brewers, meanwhile, appear to be passing on the Progressive Conservative's challenge. Barley Days brewery's Loon Lager is available in limited quantities at 11 LCBO locations: nine in Toronto and one each in Bowmanville and Sudbury, the LCBO said in a news release. According to the LCBO's website, the brewer has supplied about 3,400 cans of Loon Lager so far. Cool Beer Brewing Company, based in Etobicoke, is offering four-packs of its Cool Lager under the auspice of the buck-a-beer deal. It is available at LCBO locations throughout southern Ontario. "The people who are buying buck a beer are happy as punch," Ford told reporters as he marked the occasion at Cool's brewery. The premier said once he announced the plan during the final weeks of his successful spring election campaign, it was the main thing he heard about. "Health, education and everything is important, but all I heard everywhere I went was 'buck a beer, buck a beer, buck a beer.' So sometimes the media, ourselves even, we live in a bubble, and you don't realize some of the kitchen table issues that people want to get done ... a simple thing like a buck a beer goes a long way." So, what's the beer like? Stephen Beaumont, who has written multiple books on beer, said while some will enjoy a price drop, those who drink beer for the flavour likely won't be interested. "As a beer lover it means absolutely nothing to me," he told CBC Radio's Metro Morning. That's not elitism, Beaumont said, rather a reflection that like food or wine, making good beer that isn't plain or boring costs more money to produce. At $1 a can, he said, the quality will likely suffer. "You have to cut corners — especially if you're a smaller brewer," he said. Ford announced his buck-a-beer plan earlier this month at Barley Days' headquarters in Prince Edward County. The policy was a highly publicized campaign promise for newly minted Premier Doug Ford, but it was decried by a number of the province's craft brewers on social media. Some have said they could not afford to participate without sacrificing the quality of their product. Ford has said participating businesses will be offered prime spots in LCBO stores or advertising in the store magazine's inserts, among other possible rewards. The Tories have said a return to buck-a-beer would see more competition in the beer market without affecting the province's revenues from beer and wine taxes, which government documents show brought in roughly $589 million in 2016-2017.